It’s been a while since we checked in with San Diego’s Green Flash Brewing, but it’s safe to say that the company’s woes in 2018 were the perfect encapsulation of how the bottom has dropped out of the craft beer market for so many larger, regional breweries. Green Flash began 2018 with its beer available in all 50 states, and closed it in only eight of them—a massive contraction with waves of layoffs, aimed at restructuring the company back to the point of profitability. Like so many other regional breweries, Green Flash overextended itself through the assumption that craft beer’s boom cycle would never end. And when it did, they found themselves holding the bill. A lot of us, understandably, thought this was going to be the sad end of one of the iconic west coast IPA breweries, especially when the company ultimately went into a foreclosure sale to holding company WC IPA LLC, but Green Flash has hung on. This week they’ve debuted their newly rebranded packaging, with an eye on reestablishing themselves and their brand on the west coast. And do do so, they’ve given fans something that many of them have wanted for the last five years: The original recipe for Green Flash West Coast IPA. 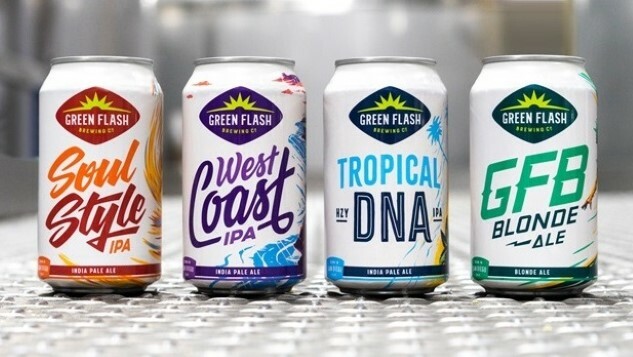 “Our new visual identity represents a dramatic shift for the Green Flash brand and reinforces its origin as one of the original San Diego craft beers,” said Ben Widseth, vice president of marketing, in a press release. You can see more of that artwork in the embedded photo below. The brand’s core portfolio now contains West Coast IPA, Soul Style IPA, Tropical DNA (a hazy IPA, naturally) and GFB Blonde. It’s West Coast IPA, though, that will likely have people most excited. A classic brand that helped define the conception of San Diego-style IPA in the 2000s, the beer was reformulated back in mid-2014, raising the ABV from 7 to 8.1 percent. The new release of West Coast IPA will revert back to the original recipe, although it’s not quite clear how much is changing besides ABV. Even if Green Flash claws its way back to profitability, it seems unlikely that the brand will ever attain completely national distribution once again. It’s clear that we’ve entered a different era as far as the beer market is concerned—massive expansion is increasingly a pipe dream, whereas mere survival means you’re doing pretty well. Hopefully, Green Flash will be able to carve out a niche in its remaining markets, on the back of its classic West Coast IPA.